Well, sure. Everybody wants to start. So what if he's just a rookie? His coach with the 49ers, Jim Harbaugh, asked Kaepernick to write down a few things he hoped to accomplish in his first season, and this is No. 1. A new coordinator tries to do what the last one couldn't with this QB: Win a playoff game. Or is that a lost cause? New coach Jay Gruden wants RG3 to be a pocket passer. That should keep him healthier. But will he be better? After an atypically awful season, they reaped a draft windfall. How much could it help? Remember the Alamo? Awfully ambitious, don't you think? In the previous 60 years only nine rookie quarterbacks had taken a team to the postseason, and San Francisco had not been there in eight seasons. But there is something different about Kaepernick. It's hard to explain, but Jack Harbaugh sees it. He is Jim's dad, a retired coach, and the previous fall he sat in his house in Milwaukee, eyes on the TV, thinking, Dammit, I should go to bed, but he was so mesmerized by this quarterback at Nevada that he stayed up long past midnight, watching him, week after week. Jim sees it too. When his dad told him he thought Kaepernick was the best quarterback in the draft, Jim said, "I think he's the best player in the draft." Whoa. Really? A rookie quarterback has never won a Super Bowl, and in the summer of 2011, Kaepernick is not just a rookie. He is an injured rookie. Only a few people know that several months earlier he injured his left leg in a Nevada game. Bone bruises, he was told. So he played through the pain. After he was drafted, he had another X-ray, and doctors explained that every black dot on the film was a stress fracture. It was not hard to find the black dots. "This thing was like a damn Dalmatian!" Kaepernick says now. "It was like cookies 'n' cream ice cream." Some men with stress fractures in their legs would not reach for the remote control without calling a doctor. Kaepernick is not some men. He went to the NFL combine, before knowing how badly his leg was injured, and ran the 40-yard dash in 4.53 seconds. That was faster than No. 1 overall pick Cam Newton and faster than Russell Wilson would run the next season, and you have to watch the NFL Network video really closely to see Kaepernick grimacing. Great, as in alltime great. That's a heck of a statement from an injured rookie backup. Even Harbaugh thinks, Seriously? "He was like, 'I like your goals, but we're kind of looking for something that is realistic for right now,' " Kaepernick says. He almost went five for five. But he didn't. Back to work. Harbaugh says he has never met anybody who combines competitiveness and compassion like Kaepernick. Many hyperintense athletes are so focused on their own success that they don't show much regard for anybody else's. This is also hard to explain, but maybe this story helps. A few days later one of his agents, Jason Bernstein, asked Kaepernick when he wanted to head to Miami to start training. Bernstein thought for a moment. That's Super Bowl Sunday. He landed in Miami and moved into an apartment while the rest of the country watched Lockette and the Seahawks win the Super Bowl. Colin Kaepernick doesn't fit into a convenient box. He kisses his biceps after scoring a touchdown but dislikes attention. He loves rap, listens to gospel on Sunday mornings and says grace before every meal. He dresses like an anti-authority figure but was a straight-A student who sat in the front row in high school. He is often curt in media sessions but is so polite in a one-on-one interview that his cheeseburger sits untouched for a half hour because he won't eat while he talks. He says he's exactly where he always expected to be and also that he was fortunate to get here. Kids think Kaepernick is one of them. Eighty-year-old women adore him. Many NFL fans see his tattoos and flamboyant on-field play and think he is a punk. 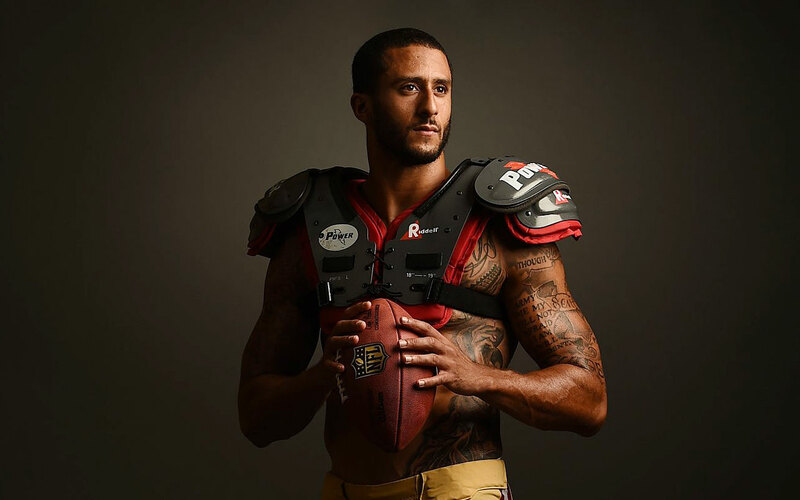 Last June, a man arrived at the Kaepernicks' house in Modesto, Calif., and introduced himself as Colin's birth father. He is not, and the Kaepernicks obtained a restraining order against him. One woman wrote a letter claiming that she is Colin's birth mother and his birth father is Sylvester Stallone. There is a prominent rumor that his father is former Packers receiver James Lofton. Wrong again. How do you get to know a man who doesn't want to be categorized? Start with the story he never tells. Lance Kaepernick was born on June 12, 1979, on his father Rick's birthday. He went home with his mom, Teresa, and dad and older brother, Kyle, but soon he was back in the hospital with a failing heart. He had two surgeries but died when he was 23 days old. Rick and Teresa were devastated. A year later they had another son, Kent, and knew right away something was wrong. Kent was born blue. More heart problems. Kent died four days later. Teresa got pregnant again in 1981, and a genetic counselor told her that if she had a boy, the risk of a heart defect was as high as 50%. Could they handle more grief? Luckily, they never found out. She gave birth to a healthy girl named Devon, and the Kaepernicks decided not to risk another pregnancy. In 1987 they adopted Colin. He was born to a white mother named Heidi Russo and an African-American father whose name the Kaepernick family knows but will not divulge. Russo gave the Kaepernicks a letter for Colin to open when he was 18, as well as half of the genetics that amaze his family, even today. Colin was so athletic that Kyle's friends nicknamed him Bo, after Bo Jackson. But his defining trait was competitiveness. "I just felt like I saw things differently than most people, as far as what I wanted to do, who I wanted to be," Kaepernick says. "Even the way I carried myself, I thought it was different. I didn't know if it was good or bad at the time. A lot of kids played sports and did things because they were fun. To me it was, How can I win? Other kids would be like, We lost the game. Let's have a sleepover. I don't want to have a damn sleepover. We just lost!" This childhood drive was unusual in the Kaepernick family, where men tend to drive toward success in the slow lane. Rick coasted through his 20s, working at a cheese plant in Wisconsin, making hourly wages, volunteering for layoffs whenever they were offered so he could spend time ice fishing and playing softball before he went back to work. He justified his lack of ambition by telling himself that every time he was laid off, he helped somebody else stay employed. He eventually realized he wanted more, so he went back to college and landed a management job at Hilmar Cheese Company in Hilmar, Calif., a half hour from Modesto. (He's now the senior vice president of growth and development.) Kyle was the same way: Smart enough to do well on his high school tests but too interested in his social life to do all his homework. He now works as a process integration manager at Hilmar. Along came Colin, who was still in elementary school when he told his parents the same thing he would write down for Harbaugh. "It wasn't, 'I want to play in the NFL,' " Teresa says. "It was, 'I want to be a big-time star in the NFL.' He has always talked that way." His drive could be exasperating. Young Colin stuffed his winter jacket into his backpack when he got on the school bus so teachers would not make him wear it. He thought it hindered him on the playground. In high school he insisted on pitching in a baseball game when he had pneumonia, against his mother's wishes. He threw a no-hitter. Kaepernick's parents realized early: This boy didn't need to be pushed. He needed to be guided. When Colin was in elementary school, his test scores were so high that he was invited to join the county's gifted and talented program. It would have meant attending a different school, with the best students in the area. Many parents were desperate to get into the program. Rick and Teresa turned it down. "It takes all kinds to make a world," Teresa says. "You need to learn some tolerance and work with people who aren't maybe as smart as you. I didn't want to isolate him and put him with just the smart kids. He [had to] learn patience." Most people in his hometown of Turlock thought his future was in baseball—he had a 90-plus-mph fastball, scholarship offers and interest from major league scouting directors. Sorry. Wrong category. Kaepernick told teams not to draft him. He was a football player. Kyle sent Colin's football highlight videos to more than 100 colleges, hoping somebody would bite. But Colin hadn't asked him to do that. He would not beg. He just played. He could have padded stats to attract recruiters, but when his coaches at Pitman High would give Kaepernick freedom—Kap, call whatever you want—he almost always chose to hand off. Boise State showed some interest but backed away. Kaepernick told one of his high school coaches, "I hope I sign with somebody that plays Boise. I want to drop 60 on them." His first game as a starter was against the Broncos. The Wolf Pack scored 67. Nevada lost in four overtimes, but Kaepernick ran for 177 yards and two touchdowns, and threw for 243 yards and three more touchdowns. He became the first major-college quarterback to pass for 10,000 yards and rush for 4,000 in his career. Still, he was viewed as raw, and a product of the pistol offense. The Chicago Cubs drafted him in the 43rd round in 2009, after his sophomore year, and would have paid him almost $50,000 to play minor league ball during one college summer, but he refused. He wanted to work at football. Five quarterbacks were chosen ahead of him in the '11 draft, and when Harbaugh chose Kaepernick to start ahead of popular Alex Smith the next year, many observers questioned the move. Then Kaepernick became a star after all those years of rejection, and people around the country said, Wow, look at that guy. What a natural talent! Look at this guy. What a dork. "Imagine him eating a bowl of cereal, watching SpongeBob, with remote-controlled helicopters all over the floor," Lockette says. "He's not cool at all. If we're out, it's probably for a reason. It's not like, We're bored, let's go to the clubs." Kaepernick's goal was always to be the best player, not the most popular or the richest. When he signed his $5.2 million rookie contract, he bought a big-screen TV, a bedroom set and a couch, and put the rest of his signing bonus in bonds. Not even stocks. Bonds. After a few months of paychecks, his financial adviser called his dad to ask why he wasn't spending any money. He owns one car, a Jaguar, and that was a freebie for an endorsement deal. Kaepernick, who looks and dresses like a hip-hop star, understands his image as the coolest player in the NFL, but he isn't interested in selling it. He doesn't even believe it himself. "I feel like I'm a good dude, and I'm a cool person to be around, but I'm not that damn cool," Kaepernick says. "As much as I'd like to think, This is great, everybody loves me, I just don't buy that. It was never like that before." Many athletes acknowledge it is fair to criticize their performance as long as you don't question their character. Kaepernick takes the opposite view. You can think whatever you want about him as a person. He knows who he is, so "if some guy in Chicago I've never met has a perception that I'm an a------, that's not gonna ruin my day." But if you question his performance, he will take note, "because to me, that's my career. That's what I've worked for." If he held a football like he holds a grudge, he would never fumble. Ask Mike Mayock. Last September, a few days before the 49ers played the Rams, the NFL Network broadcaster and his cohorts sat with Kaepernick for a production meeting, a routine procedure in which the game's announcers pepper coaches and quarterbacks from each team with questions so they can be well-informed on the air. Mayock says Kaepernick's "answers were brief to nonexistent. The attitude was basically, I don't want to be here." Everybody in the room seemed to feel the tension except Kaepernick. He admits it was "probably the shortest interview ever" but explains, "There are certain people I just refuse to talk to," and Mayock is one of them. He did not like what Mayock said about him leading up to the draft. Mayock says many players have thanked or teased him for his predraft evaluations, but only Kaepernick gave him the silent treatment. "I had no idea it was because of me," Mayock says. "My memory is, I thought I was highly complimentary of the kid." Mayock was complimentary. "He's got a huge arm, man," he said during the combine, and at one point he actually started giggling as he talked about Kaepernick's performance at the Manning Passing Academy the previous summer, where Eli and Peyton Manning were stunned by how hard Kaepernick threw. But Mayock also questioned Kaepernick's mechanics and consistency, and that was all Kaepernick needed to hear. As his brother, Kyle, says, "Once you cross him in a way that makes him feel like, You're dead to me, you're dead forever to him." And Kaepernick's mistrust of the media has only grown. This spring, he found himself in a TMZ headline, never a good place to be. COLIN KAEPERNICK INVESTIGATED FOR SEXUAL assault, the site reported, spawning a hundred more headlines and a whole bunch of agony in the Kaepernick household. The investigation concluded that there was no evidence any crime had been committed, but Kaepernick's reputation hung in the air for 69 days before he was officially cleared. His father counted. But Kaepernick was mostly annoyed by how it affected his life, his ability to do what he wanted when he wanted. He wouldn't even leave home, for fear of creating another headline. "At first, it didn't bug me, but after 2½ months, it was like, Is this what things have come to now? I'm a prisoner in my own house?" he says. "To me, what blows my mind is—nothing personal to you—but how the media is very quick to jump on anything. 'Oh, breaking news! It's a sexual assault case!' Hold on. How did it even get released that way?" He doesn't understand how people can assume the worst because he has never thought like that. In this way, too, he is the exception in his own family. Teresa calls herself "a born cynic," and Kyle says, "Most people have an angle. It's pretty rare to find people that don't." But last Christmas Eve, Rick and Colin pulled up to a stoplight and saw a guy holding a sign saying he was homeless. Colin pulled all the money out of his wallet—probably less than $50, he says—and asked his father to give it to the man. Rick said, "How do you even know that guy is really homeless?" And Colin replied, "How do you know he's not?" When Colin turned 18, Teresa handed him a letter from his birth mother. He read it once and put it back in a drawer. He already knew everything he wanted to know. Colin rarely asked questions about his birth parents. Teresa would probe him now and again, to see if there were any emotions he needed to sort out, but there weren't. But people hear that he won't meet with Russo and they shove him into another category. He is angry. He is driven by being rejected at birth. Teresa will get mad. The Kaepernicks have heard it all. The real answer is much simpler. "My family has loved me unconditionally since they got me," he says. "I never had the feeling that something was missing. Why would I go looking for something I don't need. That's a very hard concept for people to understand." Teresa has kept in touch with Russo throughout Colin's life and occasionally asks if he wants to meet his birth mother. The answer has always been no, even more so after Russo, a nurse in Colorado, went public with her plea to meet him in 2012. That is not how you get to Colin. "The harder you push, the more he'll push away," Kyle says. "I've seen it 100 times. Most of his best friends are the ones that can go a month without talking to him." Teresa has decided that she won't bring it up again, and why should she? A 1996 study by the American Adoption Congress showed that 65% of adopted children wanted to meet their birth parents. But that means that 35% did not. He is not angry. He is grateful. He has told Rick and Teresa, If another family had raised me, I think I might have been a bad kid. "I know myself," he says. "I would test the limits of everything and see how far I could push things." Puzzle solved, Coach: The competitiveness is who Kaepernick is. The compassion comes from how he was raised. After he turned pro, he found the charity he wanted to support above all others: Camp Taylor. There are several camps throughout California for children with heart disease. Colin visits and swims and talks with the kids for hours. His parents go with him sometimes. When Rick looks into the eyes of the children, he sees his own boys. Lance would be 35 now, and Kent would be almost 34, and it's easy to imagine them sitting between Kyle and Devon at a 49ers game, cheering on Colin ... except, of course, if the boys had lived, Rick and Teresa would not have adopted. Colin would live somewhere else, with other parents. Maybe he would have been that bad kid, testing the limits of everything, or maybe he would have succeeded anyway. It doesn't matter. Lance and Kent are gone, but their parents think of them every day. They remain a part of the family. Colin is their brother. "It wasn't, 'I want to play in the NFL,' Teresa says. "It was, 'I want to be a big-time star in the NFL.' He has always talked that way." Open the Google app and say, "Ok Google, show me Sports Illustrated covers of Colin Kaepernick"